Showing 35 articles from December 24, 2014. FOOD FOR THOUGHT. 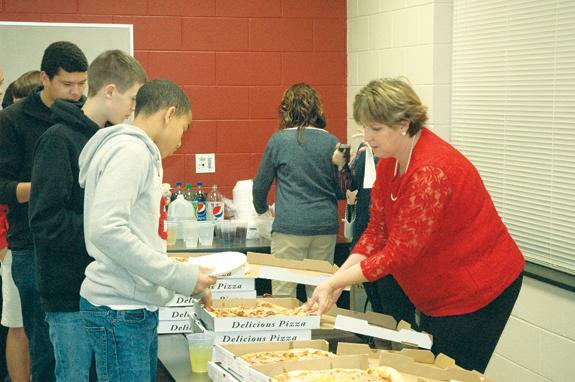 Franklinton High teacher Dottie Averette hands out pizza to students who won a meet and greet and listening party with hit recording artist Jason Michael Carroll. FRANKLINTON -- Most often, teenagers will do anything for pizza and ice cream. If you throw in a chance to have a private chat and listening session with a national recording artist, then the stakes go even higher. But country music artist Jason Michael Carroll made sure to remind students in Dottie Averette's and Kathryn Tilley's classes that their fundraising efforts are their own rewards. 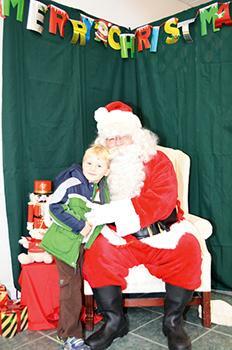 When Santa Claus visited the holiday bazaar at the Louisburg United Methodist Church a few weeks ago, one of the children who took advantage of the chance to meet with him was little Christian Journigan. Although a little shy at first -- who wouldn't be? -- Christian summoned the courage to have a little talk with Santa and make a few suggestions about what he'd like to find under the Christmas tree tomorrow morning. LOUISBURG -- Police continue to look for suspects in a pair of armed robberies reported in less than a week. Police would not say if the robberies were related. According to investigators, four suspects, believed to be men, went into the Food Lion on Bickett Boulevard the evening of Dec. 17 and brandished a gun. HENDERSON -- Members of the inaugural Agricultural Entrepreneurship class received certificates at a graduation ceremony earlier this month on Vance-Granville Community College's main campus. 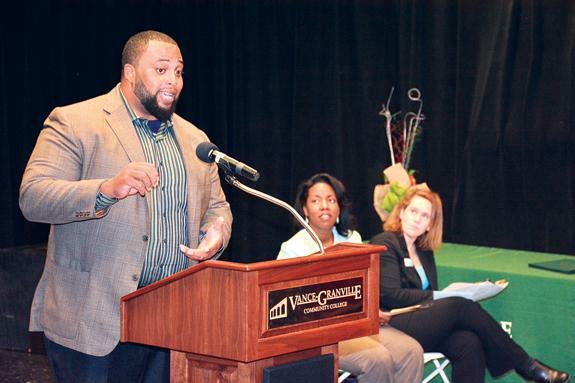 The 14 graduates of the first-ever NC REAL Agricultural Entrepreneurship class at Vance-Granville Community College received certificates and heard words of encouragement from former NFL-star-turned-farmer Jason Brown. 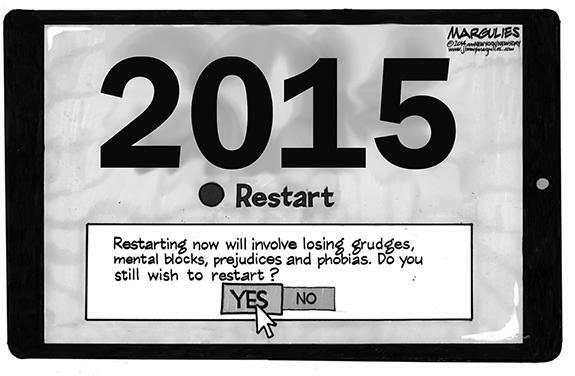 A prediction: 2015 will be an eventful year! Let's start off on a very positive note for Christmas Eve, 2014: Merry Christmas and a Happy New Year! May your holiday season be happy and safe and your new year filled with much more of the same. It's difficult to believe that the Jolly Old Gent from the North Pole is expected to make his arrival tonight -- and that the beginning of a new year is just about a week away. ... all through the night we'll fumble and fume! 'Tis the night before Christmas -- as every kid in Franklin County will gleefully inform you -- and soon not a creature will be stirring, except, of course, all those perplexed parents trying to fit Bolt B into Hole 37C so that nut 14-11(j) will hold piece G13-8-2 in place while someone finds an 11/32 box-end wrench with a short, preferably bent handle! No wait, it's got to be a metric wrench! 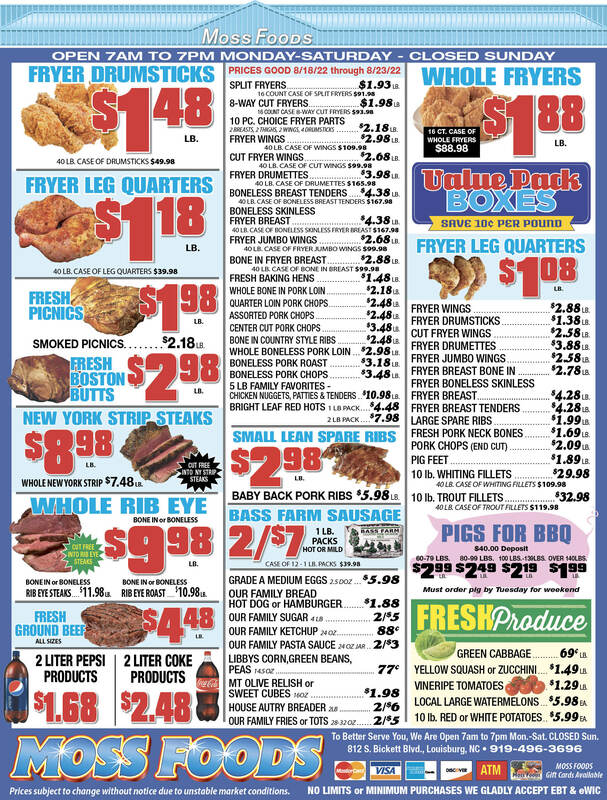 The last few editions of print and online editions of The Franklin Times should serve as a reminder: keep an eye on your stuff. While the weeks between Thanksgiving and Christmas may very well be the time to give, there are those out there who see it as the peak time to take. 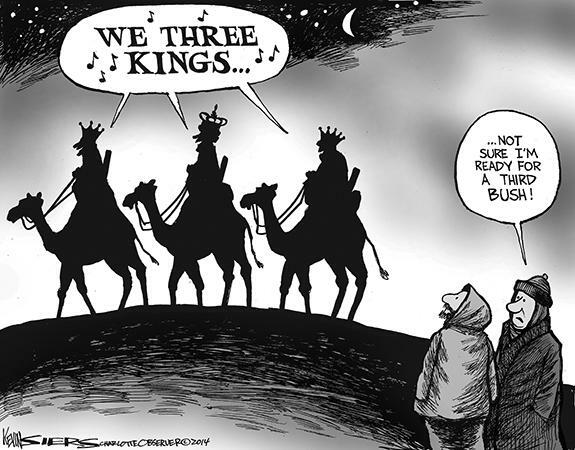 Christmas: Two principles to keep in mind all year! The dominant religion in America and, certainly in Franklin County, is Christianity. This Thursday, we celebrate the birth of Jesus Christ. The acceptance of Jesus as Lord is the foundation of Christianity. America is a secular nation. Religious freedom, which includes freedom from religious tyranny and persecution, is guaranteed by the First Amendment to the United States Constitution. The first three to five years of life represent a critical window for learning for your child, with rapid brain development that does not occur at any other time. FOCUSED. 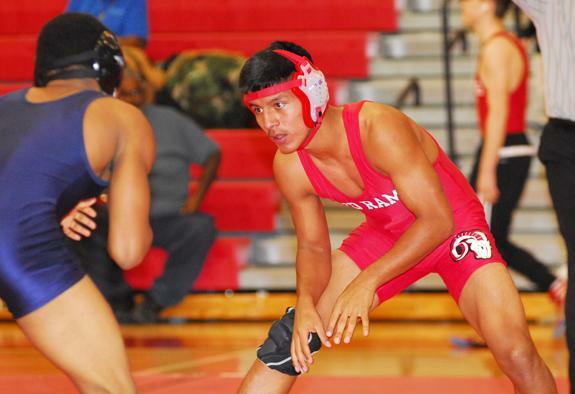 Franklinton's Ruben Santiago keeps an eye on his opponent as part of last Wednesday night's wrestling tri-match at the FHS Gym. 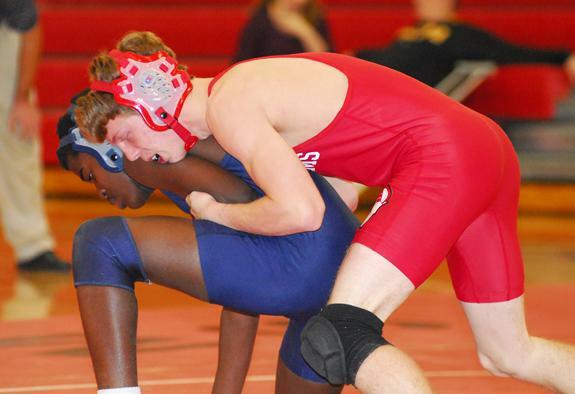 FRANKLINTON -- Franklinton High School wrestling coach Alan Carter encountered a unique proposition during his club's home tri-match last Wednesday evening against rivals Southern Vance and Nash Central. Under Northern Carolina Conference rules, the two league teams are supposed to wrestle first, followed by non-conference events against the other competing squad. QUEEN OF THE COURT. 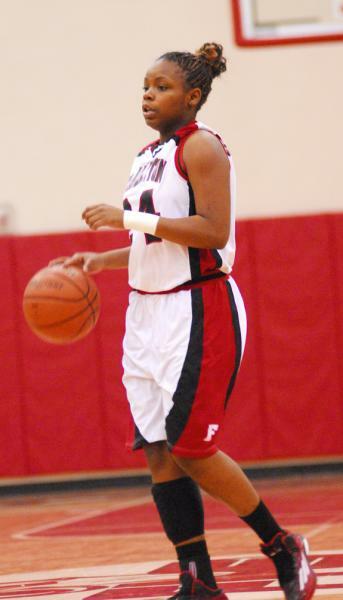 Middle hitter Anna Moss enjoyed a tremendous season on the volleyball court this fall for the Franklinton Lady Rams. 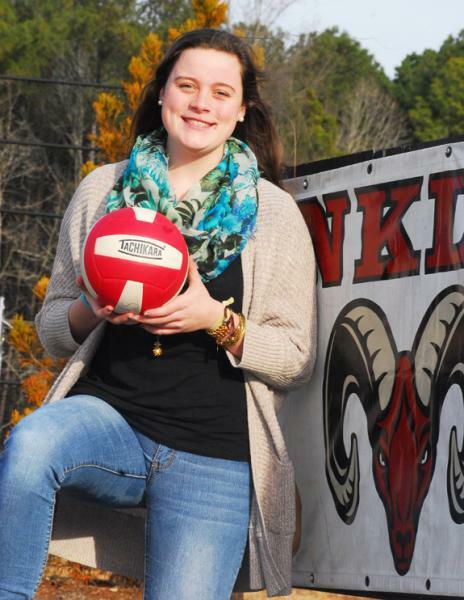 FRANKLINTON -- After securing her future over the summer, Anna Moss concentrated on the present during the 2014 volleyball season for the Franklinton Lady Rams. Determined to achieve a wealth of personal and team success during her senior campaign, Moss did exactly that while providing an exclamation point to her star-studded prep spike career. NOWHERE TO GO. South Granville High's Joseph Mitchell (left) tries to get past Bunn's T.J. Jones during last Friday night's boys basketball game. BUNN -- Judging by some of the early-season scores, parity could be a keyword this winter in the Northern Carolina Conference boys basketball standings. But the South Granville Vikings have staked an early claim to NCC supremacy courtesy of a trio of wins to start the league ledger -- including a 51-48 road decision last Friday against Bunn in a matchup of the final two conference clubs with undefeated marks in NCC action. TIGHT DEFENSE. Bunn's Tainasha Vines (left) follows South Granville's Claire Patrick during last Friday night's girls basketball contest. 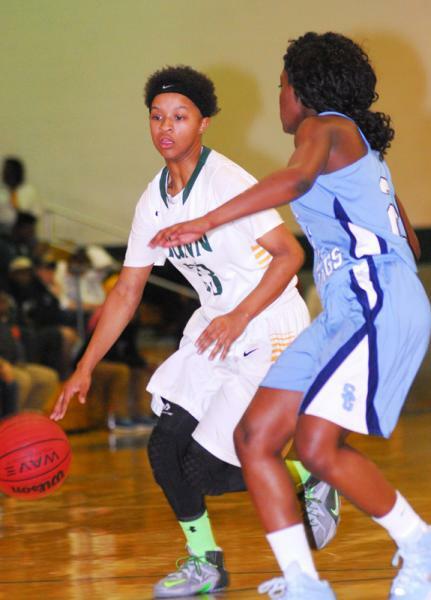 BUNN -- After blitzing through the non-league portion of their schedule, the Bunn Ladycats are now focused on winning a Northern Carolina Conference basketball championship for the fifth time in the past six years. The dominant Ladycats improved to 9-0 overall -- and 3-0 in the NCC -- with a 66-37 home decision last Friday night against South Granville at the Bunn Dome. FRANKLINTON -- Warren County point guard Michael Hargrove made one of two free throws with 5.4 seconds remaining to give his Eagles a 51-50 win over the Franklinton Red Rams last Friday night in Northern Carolina Conference boys basketball action at FHS gym. Red Rams guard Cole Gupton missed a three-pointer as time expired, as Franklinton lost its third straight contest at home. 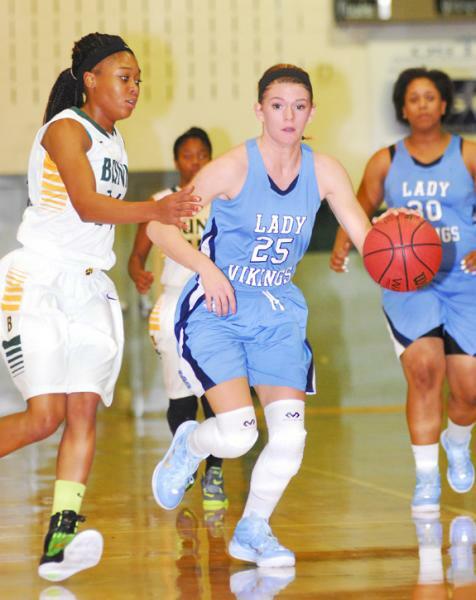 BUNN -- Bunn High School will host the BHS Christmas Basketball Tournament on Dec. 29-30 at the Bunn Dome. The event will feature a homecoming for former BHS boys coach Gerald Melton, who will bring his East Wake Warriors into Franklin County. Northern Nash and Corinth Holders round out the boys participants. PROVIDENCE, R.I. - Making its debut as a member of the American Athletic Conference, East Carolina University has been picked third in the 2015 preseason baseball poll, as chosen by the league's eight head coaches Monday afternoon. Under the direction of first-year head coach Cliff Godwin, the Pirates return 16 letterwinners including 2014 All-Conference USA Freshman Team selections Bryce Harman and Charlie Yorgen, as well as 2013 All C-USA performers David Lucroy and Travis Watkins. FRANKLIN COUNTY -- Wells Fargo, along with the North Carolina High School Athletic Association, has announced the final standings in the Wells Fargo Conference Cup competitions for the 2014 fall sports season. 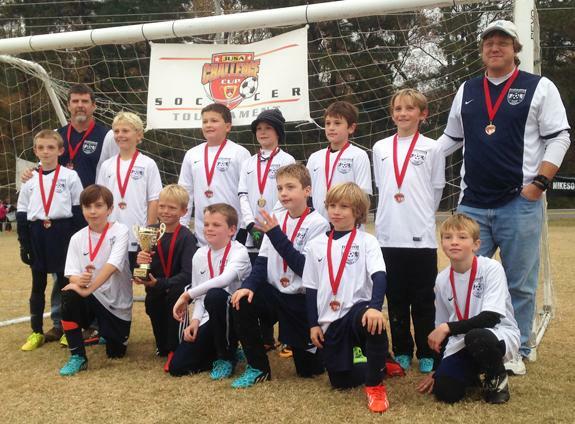 The Franklin Wake Soccer Club Team Force, a U-11 Challenge squad from Youngsville, claimed first place in its division at the Johnston United Soccer Association Challenge Cup. 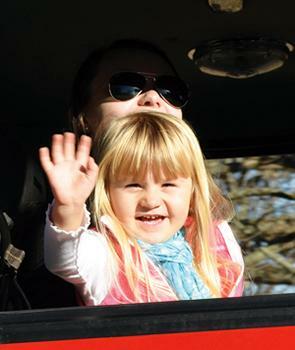 The event was held in November in Clayton. In the championship match, the Force secured a 7-1 victory over Liberty Soccer Academy. Earlier in the tourney, the Force topped XL Soccer World 03 Select Milan (9-0), Liberty Soccer Academy (10-1) and Wake Futbol Club (7-1). 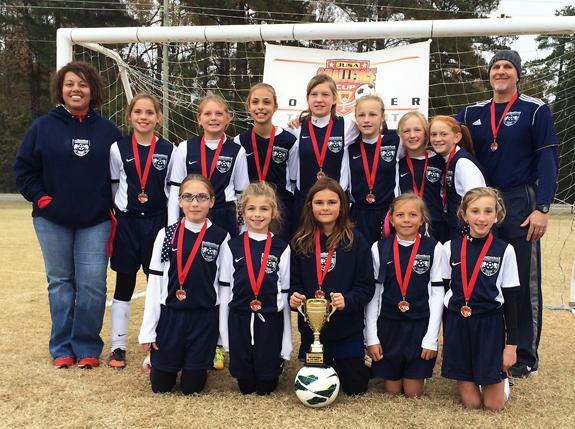 The Franklin Wake Soccer Club 11-U Girls Fury finished the fall season with a Black Division victory at the JUSA Challenge Cup in November in Johnston County. The talented squad claimed three championships for the campaign and put together an impressive 16-2-2 overall record. 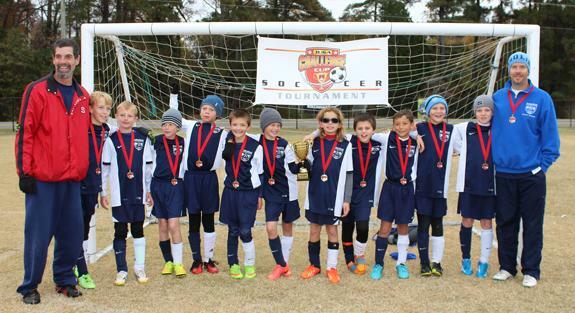 The Franklin Wake Soccer Club Phoenix posted a 3-0-1 record at the JUSA Challenge Cup, which was held in November in Clayton. The squad participated in the Red Premiere Division and defeated Wake FC Liverpool (6-2), Wake FC Celtic (7-2 in the semifinals) and XL 04 Select Daggers (4-2 in the championship match). The Phoenix also tied JUSA Arsenal 4-4 during pool play. This talented group is currently ranked No. 2 in the state and No. 10 nationally. HENDERSON -- The Vance-Granville Community College Vanguards men's basketball team closed out the fall semester and the year 2014 with a win on the road and a loss at home. 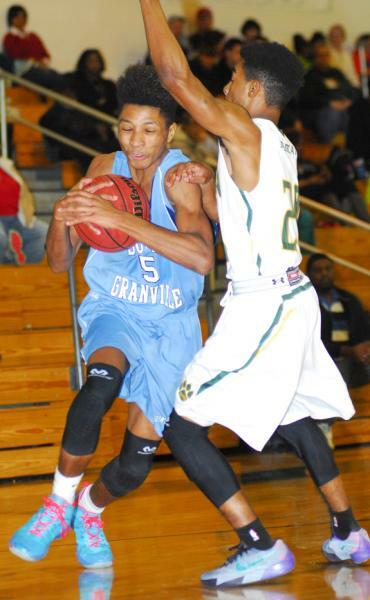 On Dec. 4, VGCC traveled to face the junior varsity team at the University of Mount Olive. The Vanguards defeated the Trojans in a dominating 80-51 performance. 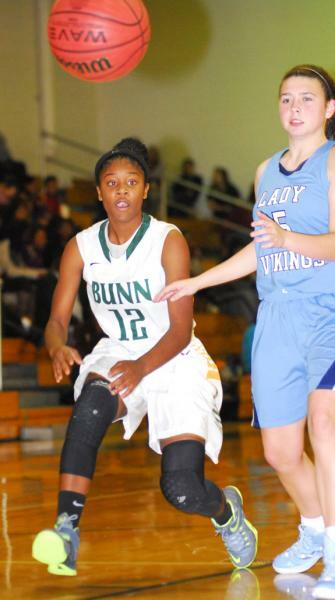 Precious Walker (left) was the leading scorer for the Bunn Ladycats during last Friday night's home triumph against league foe South Granville. Bunn's Bernadette Cooke (left) sends out another assist during last Friday night's home league decision against South Granville HS. 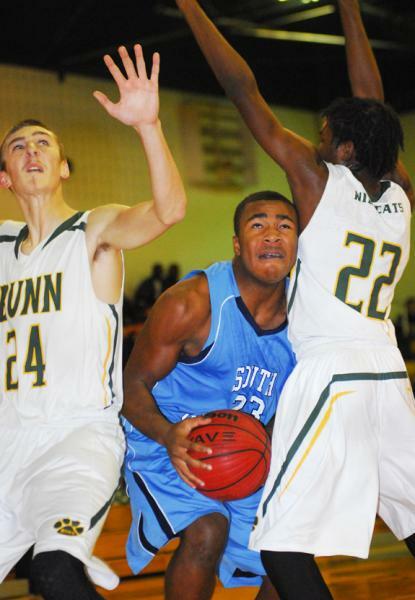 Bunn's Shane Garrison (left) and Darreus Caldwell (right) double-team Southern Granville's Earl Green during last Friday's boys hoops contest. A Franklinton wrestler (right) takes charge of his match during last Wednesday night's team event against Southern Vance High School. I am sure that all of you have thought about what's going on in the world today. It is not that easy to relax with so much unrest, hatred, acts of terrorism and human atrocity existing in so many places of the world, including our own country. All of these things can get us upset and bother us to no end, or we can take it as a challenge for growth in our lives. Gray's New Map of Louisburg, Franklin County, North Carolina, published around 1882 by O. W. Gray & Son of Philadelphia, provides detailed information about the town at a time when it was poised for significant growth. Based on a survey by engineers who visited the town, the map is one of at least 10 such maps of Tar Heel municipalities produced by the company. MIGHTY MOUSE. Louisburg Police Officer Ian Battle helps Jordan Moses get a bit more familiar with Mickey Mouse during the Shop with a Cop event this week. 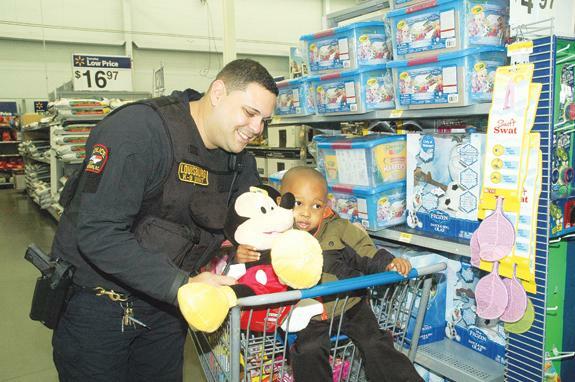 Sheriff's deputies and area officers helped kids shop for Christmas gifts. DECISION TIME. 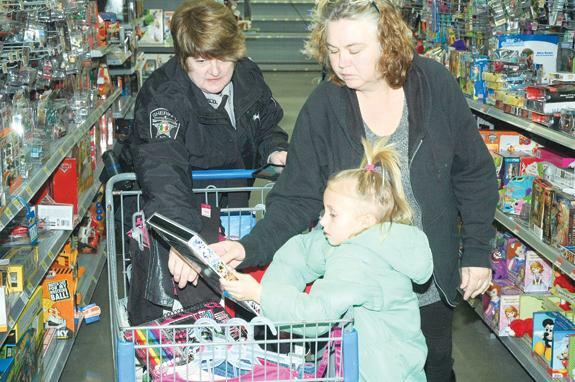 Aaliyah Lynch, front right, and her grandmother, Polly Lynch, try to figure out exactly what will make the last cut and wind up in the shopping cart, helped by Franklin County Sheriff's Det. Susan Handel. Handel joined more than two dozen officers who took part in the Shop with a Cop program. RALEIGH -- The Tobacco Farm Life Museum is accepting applications for the Innovative Young Farmer of the Year award. The award, sponsored by the Farm Credit Associations of North Carolina, will reward the hard work and innovative thinking of young farmers in North Carolina. Applications for the award should be returned to the Tobacco Farm Life Museum by Jan. 6. 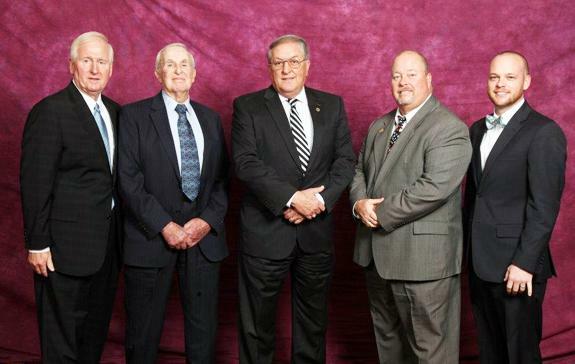 The Franklin County Farm Bureau officers and agents were honored during this year's annual meeting of the North Carolina Farm Bureau Federation held at the Sheraton Four Seasons and Joseph S. Koury Convention Center in Greensboro. Franklin County Farm Bureau President Bennie Ray Gupton was recognized among his peers at the Presidents' and Agents' Luncheon. Stephen Driver of Louisburg Tractor and Truck Company recently became a SCAG Gold Certified Technician, becoming one of only 27 technicians in the country to receive this recognition. 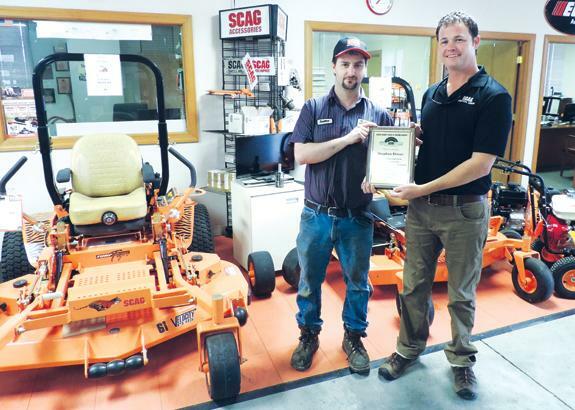 Driver (left) is shown receiving his certification from Forrest Rogers, territory sales manager of Power Tool Company's distribution area for SCAG. Louisburg Tractor is located on U.S. 401 south of Louisburg.